I hadn’t been to Frankfurt for years, but it hasn’t changed much – the Messe does make Earl’s Court look like a model exhibition hall rather than the massive arena that we all know and love. I flew out on Wednesday morning, and David was there to meet me at the airport. We decided that joint meetings would be the best idea as we were meeting a number of foreign publishers that neither of us had met. Having settled myself into my room, it was with a sense of anticipation and purpose we set off to the Messe. Luckily David knows his way around the tube system so we were there in a jiffy with a spring in our step. It is a wonderful feeling to be part of such a huge industry – all the big international publishers were out in force, their stands dominating Hall 8 (next year they are moving into Hall 6 which will make life easier for everyone). 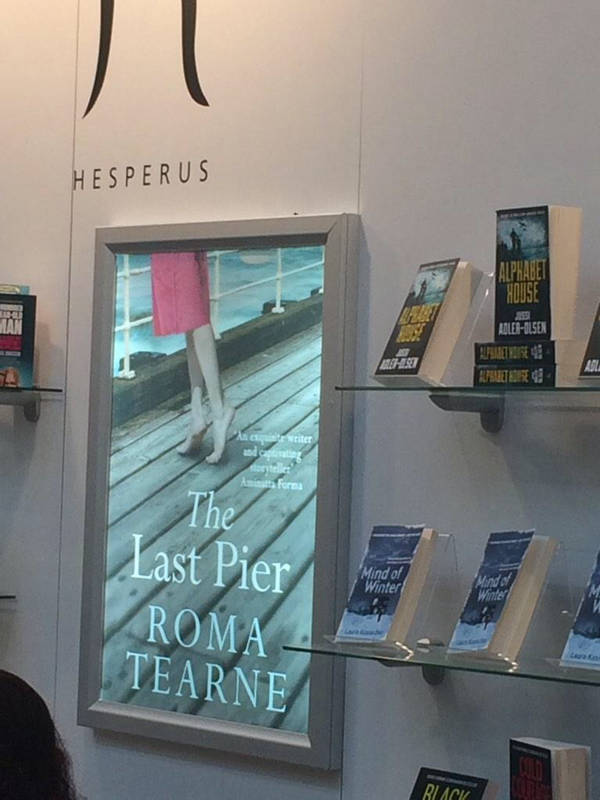 There is also something thrilling about seeing the covers of one of our books enlarged and lit up –as was the case at the Hesperus stand with their wonderful feature of The Last Pier by Roma Tearne – so that as you walk past you can’t miss it, and more importantly nor can anyone else. The days were full of meetings, but I’d like to highlight a few to illustrate what exactly happens at a book fair. One was with the CEO and Managing Director of the French publishers Univers Poche, kindly arranged by one of the UK scouts, Daniela Schlingmann. Getting into the agents centre should be easy, particularly as our meeting was legitimate, but the system demands that you register and have your bags checked (for the fourteenth time) before we were allowed in. The French were charming and seemed keen on a number of our authors and in turn were interested in us becoming sub agents for several of theirs. Neither of us had anticipated this, but if we were able to broker a deal for them it would obviously cement our relationship – and let’s be honest, this entire business is based on relationships. Another meeting was rather more tricky – with a small independent English publisher with whom I have been chatting about a non-fiction book about female serial killers, No One Escapes, written by the wonderful Carole Hayman, who is one half of the irresistible series, Ladies of Letters. It wasn’t the easiest of meetings; the editor has been considering this proposal for over a year, but sitting and discussing it eye to eye, we eventually managed to come to an arrangement, and the deal was done. I was over the moon and raced off to phone Carole who was tickled pink. Much of Frankfurt involves wandering through the extensive halls and it was lovely to bump into so many friends and colleagues. There seemed to be a buzz in the air; people do appear to be acquiring books, with a degree of caution, but the gloom of the last few years does seem to have lifted a little. On Wednesday evening we met up with our American agent, Jonathan Lyons from Curtis Brown US. He is utterly charming, erudite and astute, so time spent with him is always inspiring. We found ourselves in the Hessenhof which is the watering hole nearest to the Messe, and needless to say swarming with publishers – I’m not quite sure what the term is for a hotel full of publishers… A posse? A covern? A pride? Thursday morning we were at the Fair reasonably early to see Monica Gram at Leonhardt & Høier Literary Agency A/S because David has managed to secure a deal for one of her authors, Ragnor Jónasson. David has sold Ragnar’s atmospheric, gritty thrillers Snowblind and Dark Night (Bjartur Veröld), in a two-book deal to Karen Sullivan, former Managing Editor of Arcadia books who has just launched her own publishing house Orenda Books. This is Jonasson’s first-ever English publication so there was much to celebrate. The other exciting thing about Orenda is that Karen has also acquired WEL rights in one of our other books, The Abrupt Physics of Dying by Paul Hardisty and we’ve already had enquires of interest from French, German and Polish publishers, so it is looking good. We have every faith in Karen – and her inimitable enthusiasm – and wish her every success with this new venture. We also saw the US Publisher Llewellyn Worldwide. Their crime editor Terri Bischoff has acquired two of our authors, Adrian Magson and Eve Seymour, so it was good to chat through their covers, their marketing plans and their distribution. We tried to interest them in CrimeFest next year, because it would be good for Terri to meet her authors – watch this space. Another very valuable meeting, again courtesy of Daniela, was with Weltbild, the German publishers, who also run a bookshop so there was some synergy between us all. Elisabeth Steppich is young and enthusiastic and seemed to be keen on all our books, so hopefully there will be more good news on that front soon. We also managed to catch up with our Polish agents, Macadamia, and although their market is tough, they remain stalwart in their support of our authors. On our last night, despite terrible weather and an attack of exhaustion, we had been invited to join David Luxton Associates, another UK agency for dinner. Twelve of us, including our invaluable foreign rights agent, Louisa Pritchard, and their Brazilian agent had an extremely jolly supper – but rest assured, David and I declined the offer of a trip to the Frankfurter Hoff and were back in the hotel before midnight. PS. Stop Press: Louisa has just finalised a deal for Paul Johnston’s The White Sea with his Greek publisher, Psichogios – just goes to show how valuable Frankfurt actually is. Reading this is so inspiring. Delighted for all those authors for whom you’ve secured well-deserved deals, and glad you had a chance to talk to Llewellyn. Definitely put more spring in my step this morning… Whoops – other half has just told me that I need my springs dampened to prevent excessive wear! I’m having none of it. How exciting and inspiring…to be part of such a wonderful industry is a goal worth working towards. Keep searching out those deals! I admire your writing style. I hope you enjoy mine.